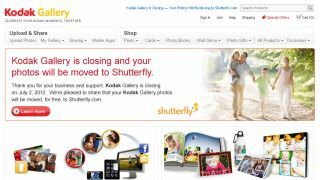 The sale of Kodak Gallery has been completed, with online sharing website Shutterfly making the purchase. Kodak Gallery has been in operation for over a decade, with the sale of the service to Shutterfly thought to be for $23.8 million. The beleaguered icon of photography announced earlier in the year that it was to stop producing cameras in favour of printers after filing for "bankruptcy protection". Over the past few months and years, the company has been selling off various patents and divisions of the company in a bid to raise extra cash. Although $23.8m may seem like a large fee, it of course pales in comparison to the recent Facebook acquisition of Instagram for a whopping $1billion. Shutterfly is a service that enables users to store and share images online, as well as creating custom printed photobooks, cards and albums. It offers free, unlimited photo storage with a "100% customer satisfaction guarantee". Current users of the Kodak Gallery will have their images transferred across to Shutterfly - unless they choose to opt out of the service. Images will no longer be viewable after July 2. Writing on the Kodak Gallery website, its general manager Victor Cho said, "We are absolutely committed to making this transition as smooth and easy as possible."